Stationery is another one of those items I am leaving up to natural progression decluttering. It is a very slow process though. This evening I made a very small dent in our supplies and fulfilled a request from my daughter at the same time. Last week, she asked me to print her a copy of the family cookbook that I had painstakingly digitised about 10 years ago. I have added new recipes as I have tested and deemed them good enough to add to the regular rotation. …the coloured paper was bought for another project some years ago. The sticky tabs are just spares. I am happy to say that the plastic sleeves and binder are from papers we decluttered a while back so are being reused. That’s only a drop in the bucket when it comes to the using up the abundance of stationary in our house but it’s a start. The cookbook in question. I know it is very 1990’s in layout but that is when I originally digitised it and I am not about to go to the bother of updating. It isn’t quite finished yet but it is close enough to photograph for today’s post. I should really start a digital version of my favorite recipes. They’re all in my head, so when it’s been a while, I forget what I’m supposed to do. 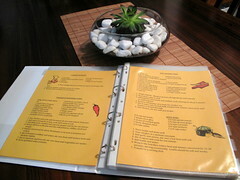 there are so many great programs now for digitising your recipes. I only used Word to type mine up but like I said that was a long time ago. Now the programs can create shopping lists and all kinds of helpful functions. As for forgetting, I use my copy of my recipe book every time I cook something even if I have made it over and over again, just in case. at first I told my daughter I would just send her the file too but then I realised I had a chance to declutter something in the deal so I printed it for her. sounds like we have found your weakness. Believe me when I say you are just as well off to still us Word as to use any of the recipe programs that are out there. I’ve tried dozens of the free or inexpensive ones and they are all buggy and not user-friendly in the least. The good ones are professional grade and cost more than a set of tires. I had heard that about free recipes organisers as well. Some change their formatting with the next upgrade and you can’t access your files anymore. All that effort gone to waste. Don’t be too hard on yourself about your 25 year old stationary. You are using it now and learned something from the experience. I can’t stand waste from my kids old school exercise pads and cut out all the unused pages. I won’t have to buy writing paper for about 10 years but I hate waste and insist on using it up. I think your receipe book is very charming and years from now your daughter will pull out the recipe book all stained and floured to share with her kids! So much nicer that sending the file! thank you, I think so too. The beauty of the plastic sleeves is if she does get ingredience on them she can just wipe it off. I do it all the time. I have been trying to digitize some recipe from my belated aunt. The issue there is I want scanned copies of her recipe cards, not just type-written recipes because these are in her handwriting. I haven’t figured out a nice way to format them into Word for printing. The pictures come in bigger than original size and take a lot of fussing to get the way I want them. Hence, I haven’t done many pages yet. I probably can’t help with this without seeing how you are going about it or what result you are looking for. Is there a reason you can’t just scan two to a page exactly as they are and print straight from your scanner. I never print images in word unless I am adding them in with a text document. I would save them as tif, jpeg or the like and print them with photoshop or a program like that where you can manipulate the images to exactly what you want. in more ways than you know. I hope she knows that but!